Cell phones have had a huge influence on how people today live, work, and play. But like many technological advances, they have both upsides and downsides. Cell Phones and Society examines the many ways that these crucial devices have benefited and complicated modern life. All books in the series include fully documented quotes from experts, consumers, and others, along with sidebars highlighting topics of interest. How Do Cell Phones Affect Health? 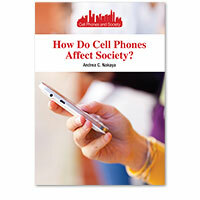 How Do Cell Phones Affect Society?